TAP Pharmaceutical Products has agreed to pay the government a record $875 million to settle extensive civil and criminal charges of illegally marketing and manipulating the costs of Lupron, a prostate cancer drug, under the Medicare and Medicaid programs, the Department of Justice (DOJ) announced October 3, 2001. The amount consists of $290 million in criminal fines and $585 million in civil penalties. The settlement amount surpasses the $840 million deal Nashville, Tennessee-based HCA, Inc., struck with the government last December. TAP also will enter into a seven-year corporate integrity agreement with the HHS Office of Inspector General. TAP is a joint venture between Takeda Chemical Industries, Osaka, Japan, and Abbott Laboratories, Abbott Park, Illinois. The DOJ also announced indictments against one physician and six current and former TAP employees. Four physicians already have been charged and have pleaded guilty. A former vice president for sales at TAP, a urologist, and the urologist's employer, Tufts Associated Health Maintenance Organization, Waltham, Massachusetts, were whistleblowers and are entitled to about $95 million of the government's recovery. Many of the alleged violations involve manipulating average wholesale prices (AWPs). The magnitude of the settlement could hasten radical changes to the use of AWPs in the Federal drug-pricing system, and may even end such use. A recent report by the HHS Office of Inspector General concluded that the AWP approach is fundamentally flawed (go to http://www.dhhs.gov/progorg/oig/oei/reports/a544.pdf). 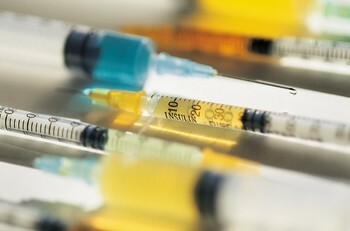 Notably, last January, Bayer reached a $14 million settlement with the government for manipulating AWPs for some drugs used to treat hemophilia and AIDS (see March 2001 "Updata" at http://www.hfma.org/Magazine/march01/updata.htm). Rep. Pete Stark (D-Calif.), ranking member on the House Ways and Means Health Subcommittee, commented regarding the TAP settlement that, "Pharmaceutical companies have been bilking the American consumer and the Federal government for years. It's about time we hold them responsible for breaking the law." Rep. Stark also commented that the fraud that has been exposed so far is only the tip of the iceberg. "Investigation after investigation has identified rampant abuse of the AWP," he said. "I hope this settlement is merely the beginning in a series of similar cases brought against pharmaceutical manufacturers." Rep. Billy Tauzin (R-La. ), chair of the House Commerce and Energy Committee, remarked that the size of the settlement underscores the need for reform of the nation's drug payment system. He commented that the system "invites fleecing of the Medicare program and the American taxpayer to the tune of more than $1 billion each year." To read DOJ's announcement, go to http://www.usdoj.gov/opa/pr/2001/ October/513civ.htm. To read TAP's statement, go to http://www.tap.com/news/ and click on the October 3, 2001, item. To read Stark's remarks, go to http://www.house.gov/stark/documents/ 107th/medicaresolvency.html. To read Tauzin's remarks, go to http://energycommerce.house.gov/107/news/10032001_382.htm.